Well things have been a bit crazy and now I have to time to get everyone up to date. June was a good month training and racing. I did 240 miles for the month and 3 races. Two 5ks and a 5 miler. I broke 1400 mile for the year. I am about 175 miles over where I was this point last year. July 12th is the official date for the 16 week training to begin for the NYC Marathon. I have been keeping my base over 50 miles for the past few weeks so the transition to training mode should not be that difficult. It will be good to begin training and even get some speed work in. Happy belated July 4th. 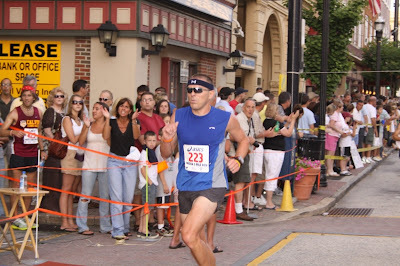 Speaking of July 4th I did a 15k yesterday in Downingtown, PA. This race is in it 31st year. They have a 5k, 10, 15k and 5k walk. It was nice race 3 loops for the 15k. I ended winning the 15k in a time 55:40 (clock time) I posted my splits below. It was hard to tell who was winning or even racing the 15k until the 3rd loop. I saw a guy ahead of me and I knew that was leader. I stayed on him and noticed him begin to fade. As we hit a small hill I made my move and passed him. I ended up catching the police who were out to ride with the leader. They realized that I was in front and then took off. I hammered the last mile out and won by over 40 seconds. It was a good race. A lesson to be learned from this race is that it is not over til the end. I wanted to win so I was going to catch this guy or make him try to the end to keep me in second. As you can see the first one prevailed. Here are my splits. Enjoy your week. Stay hydrated and wear sunscreen.